As ever a post mortem on a result is worth having because something may come of it. And this is what this new blog category is about; it’s looking at reasons that perhaps explain why an unfavoured horse won. Perhaps there may be something that could be taken from a post mortem, perhaps there isn’t. But, all the same it’s often interesting to look at a good priced winner (or a very low priced loser) and seeing if one could see if there is anything to look at in the future in case there’s a pattern. Here’s one to start off with. 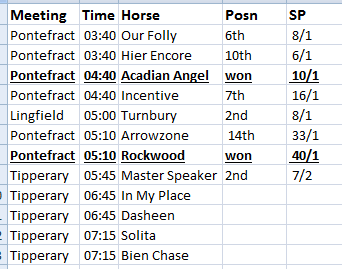 In the 5.10 Pontefrace Rockwood won at 40/1 (available at 125s on the exchanges) and looking through the ratings we can see the following on the Trainer Calendar. Rockwood is near the foot of the ratings but we can see that the trainer, Karen McLintock, has an overall training history (over the last five years) of 46 winners from 360 runners, a strike rate of around 12%. These figures result a loss of £80 if £1 were staked on each runner. Such as loss isn’t uncommon and, indeed, its a rare trainer to show a profit over the last five years. But come left to the Trainer Calendar part of the table and we see a different picture. As a reminder, the Trainer Calendar looks at the fortunes of a trainer at this point of time over the last five years. So today’s date is the 11th of April and so we if we look at the interval of the 4th of April to the 17th of April over the last five years (the fifteen days centred on today’s date) we can see a different story. McLintock has saddled only nine runners but has had four winners. Not only does this mean that she has a far better strike rate over this period but she’s profitable. So we have something which could be looked for. Are there any other horses out there today which have the following trainer criteria. That overall, over the past five years, the trainer is unprofitable. That the period shown on the Trainer Calendar the trainer is profitable. That the strike rate of the Trainer Calendar period is twice that of the overall figure. These are just arbitary starting points but it’s a start and it’s a good place to begin the analysis and, of course, let’s have a look at today’s racing for a start. It’s not quite 6.40 when this is being typed so there’s no results for the last few races but here’s the day’s runners which fit the above criteria. So what of the earlier winner today, Arcadian Angel, which won at 10/1? The trainer, JJ Quinn, has an impressive 254 winners from 1,941 runners giving an overall loss of £352 for £1 stakes and a strike rate of 13%. But the Trainer Calendar period shows a better story: 20 winners from 74 runners. A strike rate of 27% and a profit of £46. This being a post mortem is just the first step of discovery. There may be nothing in this or this may be something that simple or it could be that a few tweaks are needed along the way. But it’s a start of a new angle to explore and, if nothing else, is interesting. Update. The 6.45 Tipperary was run just after this post was published. Dasheen was the winner at 10/1. This is something which clearly needs to be investigated.